Click on chart for more information on Tesla stock. 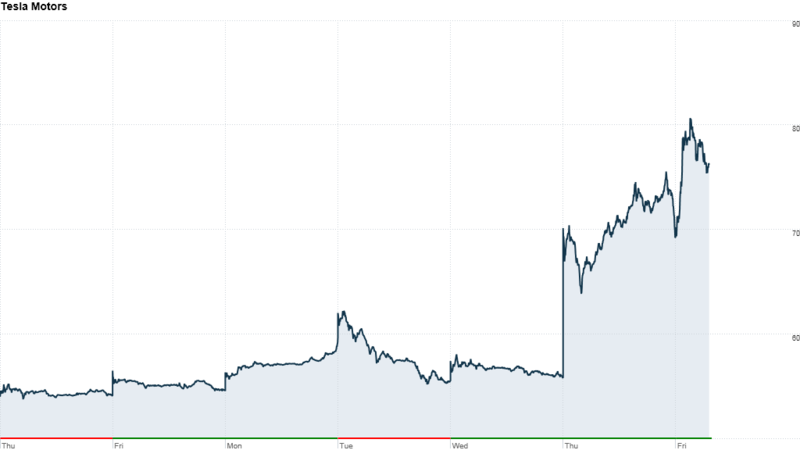 Tesla Motors stock continued to soar Friday, capping a week in which the electric car company reported its first profit and had its Model S dubbed the best car ever by an influential reviewer. Tesla (TSLA) shares were up about 10% in midday trading Friday. While that was off of the highs of the day, shares are still up about 40% for the week. Tesla reported its first quarterly profit Wednesday evening after the close and raised its sales guidance for 2013. A day later, Consumer Reports gave the Model S the best review of any car in the magazine's history. The stock soared 24% Thursday. 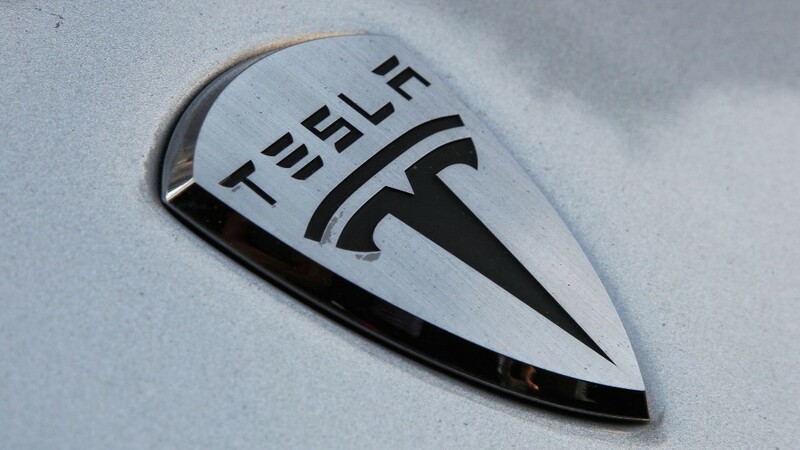 Two analysts, Brian Johnson of Barclays, and Colin Rusch of Northland Capital Markets, both raised their price targets for the stock after Tesla's earnings report. It was the second time this week that Johnson lifted his target. "We raised it Monday to $65 and people thought we were crazy. Then we raised to $72 and people think we're less crazy," he said. Tesla hit an all-time high of $81 Friday. Rusch was even more aggressive, taking his price target to $95. He said investors who had been skeptical about Elon Musk's start-up car company are becoming convinced it can not only compete in the high-priced luxury car market but has a chance to break into the mass market as well. He described Tesla as "a best-in-class company" that is defining the electric car market. Tesla's shares might also be being helped by a short squeeze, said Rusch. Those who bet that a stock will fall in value borrow shares and sell them with the hopes of buying them back for a lower price at some point in the future. But if a stock starts to rise, the short sellers may be forced to buy shares sooner than they would like to limit their losses, which in turns drives the stock even higher. "There may be some follow through the short squeeze today," said Rusch. "I don't know how much pain those guys can take." Just how dramatic has the spike in Tesla been? Consider this. Tesla's market value is now nearly $9 billion. By way of comparison, General Motor, (GM) the nation's largest automaker, has a market value of about $43 billion. So GM is worth only five times as much as Tesla. But GM reported 65 times more revenue, 100 times more profit and nearly 500 times more vehicles sold globally than Tesla in the first quarter.